Silent it may be, but does it cool well enough? For an i7-compatible cooler, Thermaltake's Silent 1156 is a compact beast, with a svelte fin stack that's smaller that the 9cm fan housing. It's main rivals are the well established CoolerMaster Hyper 101 and Arctic Cooling's Freezer 7 Pro (see a theme with these names?). The Silent 1156 has just two 8mm heat pipes. As you might guess from the name, it fits Intel's LGA 1156 boards only, but it fitted onto our 1366 test board, so what the heck. If space is an issue, then this will do nicely. Fitting is handled by plastic push-pins, which we learned to despise during testing. They well might be 'tool-less', but honestly, we can all get hold of a screwdriver if we need to. They're not really sturdy enough for repeated use and break all too easily. Performance was mediocre and it ran hotter than big towers– hardly a surprise given its proportions and, to be fair, we are going beyond the design parameters here by using an i7 920. At idle it ran at 50 degrees, and at load it reached 65 degrees. Bigger coolers, such as the Gelid Solutions Tranquillo, can manage numbers in the 40s and 50s here. It was perfectly stable however, but has little room for experimentation with overclocking. We asked a bit much perhaps. 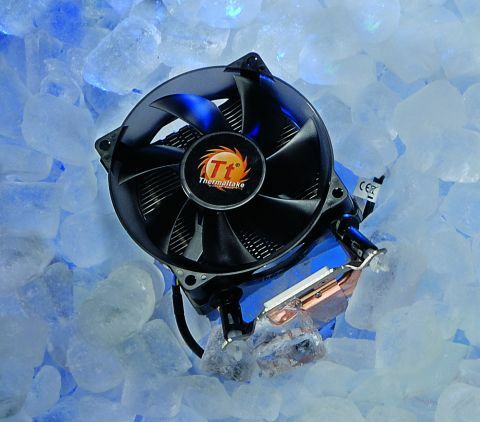 Stick to less demanding processors and its cooling ability is perfectly adequate. It's supposed to be 'silent' and, fair dues, the fan is indeed a quiet one. The Silent 1156 is good value, always a good thing. It lacks cooling power for the full i7 range and is not one for exploring overclocking too much. If this is your intention and you've got the space, then you'll need to go bigger. That, and those nasty fittings, aside it's a decent enough, but you can find better.